Arizona’s wine scene remains a bit of a black hole for me. I’ve written about visits to AZ Stronghold and Fire Mountain, which began to clue me into the state’s potentially bright wine future, but beyond that and a few bottles of the state’s most famous winery, Caduceus, that had been it for me. When samples arrived from Aridus Wine Company, I was excited for the opportunity to try another producer. In preparing to write this post, I wanted to see how much wine the state was producing, and it is paltry. In terms of bulk wine, Arizona produced less in 2017 than Arkansas. Florida produced five times more in the same year than did Arizona. Indiana nearly quintupled Arizona’s production. In total, the state produces 0.0000003% of the nation’s bulk wine. In terms of what goes into bottle, the percentage drops a bit to 0.00000026%. Though I don’t have numbers, I know a decent amount of the state’s wine comes from grapes sourced outside the state. Still, that Arizona has any national reputation for wine, and it does have a budding one, is staggering giving its contribution by volume. Having had good wine from Arizona, when I spoke to Aridus’ winemaker, Lisa Strid, I asked her the same questions I’ve asked other winemakers from the state: is Arizona ready for the national stage, and what’s keeping it from mainstream conversation? She boiled it down to the state’s biggest limitation, water. Arizona has long had water issues, and it’s scarcity, especially where grapes grow best, limits volume and quality. Water availability hasn’t been an entirely solvable problem for the state in general, so marshaling more for the luxury that is wine production hasn’t been a winnable fight. Without sufficient water, they can only make so much wine. Full stop. Working with what water they do have available, Aridus gets juice from its own vineyard and other sources both in and out of the state. Right now, only some of its whites are coming from estate fruit, while the reds haven’t come online yet, though Aridus is making a concerted effort to ramp up planting and production of more of its own vines. Their vineyard is in Pearce, located up against a stream-fed hillside where there is slightly less water pressure. The site is also at a higher elevation than the rest of the AVA, which helps to moderate the temperature a bit. All of this helps the site do a better job at retaining acid in the grapes, a constant challenge faced by Arizona wineries in achieving lower pH levels. As more of their estate fruit comes on-line, hopefully the wines will hit lower pH and achieve more brightness. 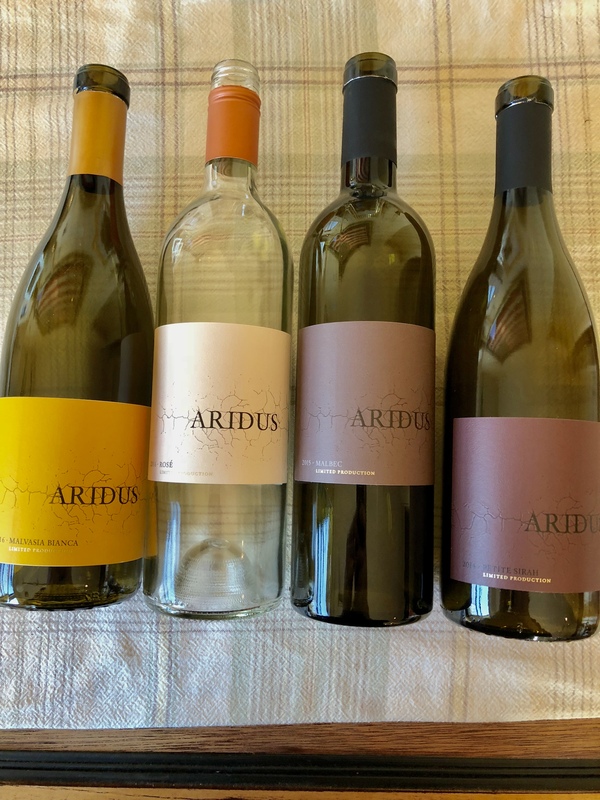 Aridus produces a wide range of wines, and the four I tried are best described as “big.” All of the reds get oak treatment, typically around 18 months in anywhere from 40% to 100% new oak, most of which is French. On the white side, they go for “a lot of expression of the grape – bold aromas and flavors.” They’re bold in structure, too. Lisa is high on their Malvasia, which I tried along with the Rosé (of mourvedre), malbec and petit sirah. I was able to confirm that the house style described came through in the wines. The Malvasia was indeed expressive, and had an interesting texture that gave substance to its volume. The Rosé was a very nice full-bodied sipping wine, and one that I think is probably best had on its own due to its lower acid. Both the malbec and petit sirah are big bodied wines that show their extensive oak, which dominates at the moment. While alcohol levels on both are modest, I do wonder if the higher pH can facilitate better integration of oak and drive more expressiveness with age. What I find most exciting and interesting about Aridus is the evolution it could take as more estate fruit is cultivated, which sounds like promising material from which to make wines of increasing quality. Lisa is working with a big variety of grapes, not all of them from Arizona, and so she’s having to deal with a plethora of evolving challenges and conditions. This is standard for experimental winemakers in emerging wine regions. Lisa recently returned from a harvest in Australia where she learned a few new tricks that she wants to try out at home. More vines will go into the ground at the Aridus vineyard. She’ll have another vintage under belt at the end of this year. Other Arizona winemakers will try and share new knowledge with each other. All of these are necessary to developing a wine region and house styles, and it’s fun to watch it happen. I think that you are woefully uneducated about the Arizona wine scene … in my visits in the last 3 years, I have enjoyed wines from the Elgin-Sonoita areas by Dos Cabezas Wineworks (aglianico, sangiovese, tempranillo), Sand-Reckoner (a lively picpoul) (winemaker Ron Hammelman was named one of the top ten winemakers to watch by Jon Bonne of the San Francisco Examiner) and Sam Pillsbury in Cottonwood. There may not be much made, but there’s some juice being produced from locally grown fruit down there. I hope you have a chance to visit … I could refer you to some avid local wine enthusiasts if you get down to the Tucsan area. I totally agree Marshall Wehr!! We’d love to show the author around! With a little more research on the authors part a truer picture of the Arizona wine industry could have been written! The authors limited knowledge of the bigger picture of what is going on in the state is sadly obvious. Most famous winery in Arizona is Caduceus? How does the author validate that?? While Maynard James Keenan does a great job with his wine and certainly has a loyal following and is a great supporter of the Arizona wine industry and up and coming winemakers with his Four Eight Wineworks co-op/incubator in Clarkdale and brings attention to Arizona wine because of his “rock star” status many other of his great winemaker friends have their loyal followers as well. “Bulk wine”?? What’s up with that? That is not the business model of the winemakers that I know. Perhaps a few in the state want to reach that level of production required for national distribution. My guess is that most Arizona wine is sold through the wineries wine clubs, in their tasting rooms, at wine events and/or within the state through their distributors. Most wineries are small and boutique family run operations by choice. Grapes sourced from outside the state? Maybe for a few whose local vineyards haven’t produced a crop yet and for a few urban wineries who have that as their business model. Many quality wineries are producing wine from 100% Arizona fruit. I would refer the author to Google the Arizona Vignerons Alliance. Also while the author is online Google the Arizona Wine Growers Association for additional information. Also Google the Southwest Wine Center. Problem with water? No so sure about that. While water in the desert is always a concern growing wine grapes is the least water intensive crop to grow compared to corn, cotton etc. that are also grown along with others in the desert Southwest. The author obviously doesn’t understand the geology, elevation and soils of the Willcox AVA. Vines are on a drip system and we all know that vines like to struggle. Diurnal temperature swings also help the ph in the wine. The author failed to mention the elevation of the Aridus vineyard. Pearce Arizona is at 4,500 feet. That is pretty typical for most vineyards on the Willcox Bench give or take a few feet depending on location.